One way of engaging students in authentic cross-cultural science inquiries is to challenge them to solve a science and technology problem that would have presented itself to pre-contact Indigenous peoples. The following fun-filled activity is one of several that I use to engage students in lively discussion on the contributions that Aboriginal peoples have made to the sciences. I introduce the activity by telling the intriguing story known to west coast Aboriginal peoples and historians as “Money from the Sea” (Snively, 2009). For 2,500 years, until the early 20th century, North American Indigenous peoples used the dazzling white cone-shaped shell of a marine mollusk as currency. Dentalium pretiosum is a 5 to 7.5 centimeter long mollusk of the class Scaphopoda, a group also known as tusk shells because of their slightly curved, conical shape (Figure 11.1 and Figure 11.2). Dentalia inhabit coarse, clean sand on the surface of the seabed in areas of deep water, and are often found in association with sand dollars and the purple olive snail (Olivella biplicata). Figure 11.1 ▲ The mollusk’s muscular foot and streamlined shell allows it to burrow into sandy bottom sediments. Illustration by Laura Corsiglia (2007). Figure 11.2 ▲ Cross section of dentalia burrowing into sandy bottom sediments. Illustration by Laura Corsiglia (2007). As predators, they use their streamlined shape and muscular foot to move surprisingly quickly in pursuit of tiny single-celled prey called forminifera. Aboriginal peoples used many substances as trade goods, but dentalia were the only shells to become currency. Harvested from deep waters off the coast of Vancouver Island, they were beautiful, scarce, portable, and not easily counterfeited. In 1778, Captain James Cook of the British Royal Navy visited the village of Yuquot (Friendly Cove) on Nootka Island off the west coast of Vancouver Island, BC. The island’s fur trading potential led the British East India Company to set up a trading post at Yuquot, which became a focal point for English, Spanish, and American traders and explorers. Trade between Euro-Americans and Aboriginal peoples was initially conducted under the watchful eye of a powerful chief named Maquinna who acted as middleman, purchasing sea otter pelts using dentalia as currency and then reselling the pelts to white traders in exchange for other goods. 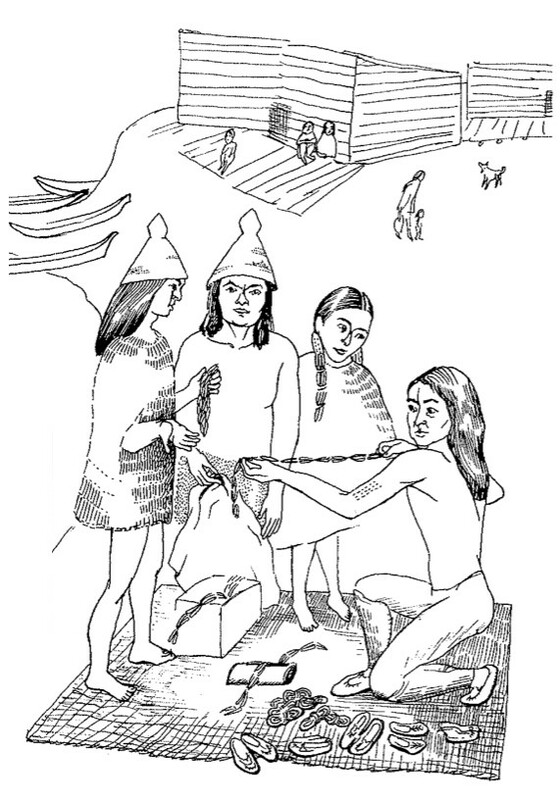 Figure 11.3 ▲ Here, members of an Ehattesaht village, circa 1800, barter strings of dentalia for iron chisels. Illustration by Laura Corsiglia (2007). Once the white traders realized that shells were used as money, they began trading directly with dentalia harvesters among the Nuu-cha-nulth and Kwakwaka‘wakw people. The center of the fur trade subsequently moved to Nahwitti, a Kwakwaka‘wakw village on the northern tip of Vancouver Island (Nuytten, 2008b, p. 23), and dentalium shell money became a currency of cross-cultural trade, called Hy‘kwa in Chinook Jargon—a trade language spoken as a lingua franca in the Pacific Northwest during the 19th and early 20th centuries (Figure 11.3). The currency was used throughout Alaska, down the Pacific coast as far as Baja California, and across the prairies of the United States and southern Canada to the Great Lakes (Figure 11.4). 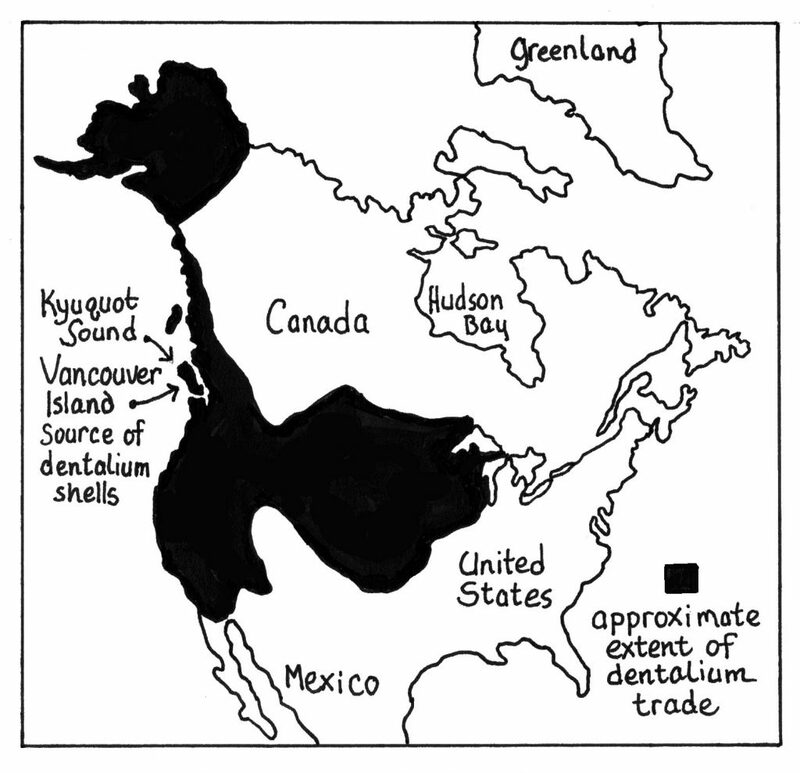 Figure 11.4 ▲ Extent of dentalium trade. Illustration by Karen Gillmore. In addition to their use as currency, the pearly white dentalium shells also served as decorative wealth. They were fashioned into necklaces, bracelets, hair adornments, and dolls. The shells also decorated the clothing of both men and women (Figures 11.5, 11.6, 11.7 and 11.8). Figure 11.5 ▲ Oglala Sioux woman photographed in 1908 wearing a dress adorned with dentalium shells. Photo by Edward S. Curtis (c. 1880). Public Domain. 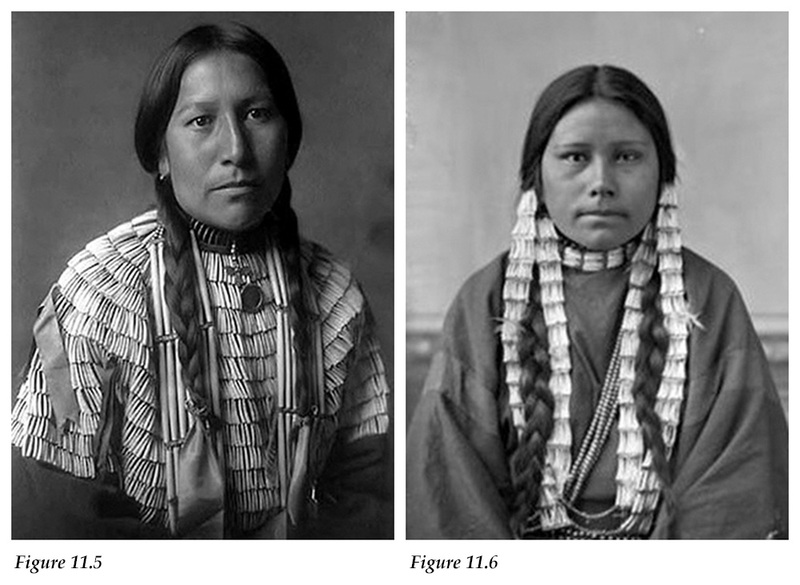 Figure 11.6 ▲ Braided hair adorned with dentalium shells, Two Bears daughter, Dakota. Photographer unknown. (c. 1880). Public Domain. Figure 11.7 ▲ Doll (c. 1890). Dentalium shells dangle from the braids and form a necklace for a Sioux doll. Making dolls was an important opportunity for young girls to learn to tan hides, sew, make clothing and beadwork. Sioux children used these dolls to play camp, complete with miniature tipis and horses. Photo reprinted with permission, American School, (19th century) / Detroit Institute of Arts, USA. All rights reserved. 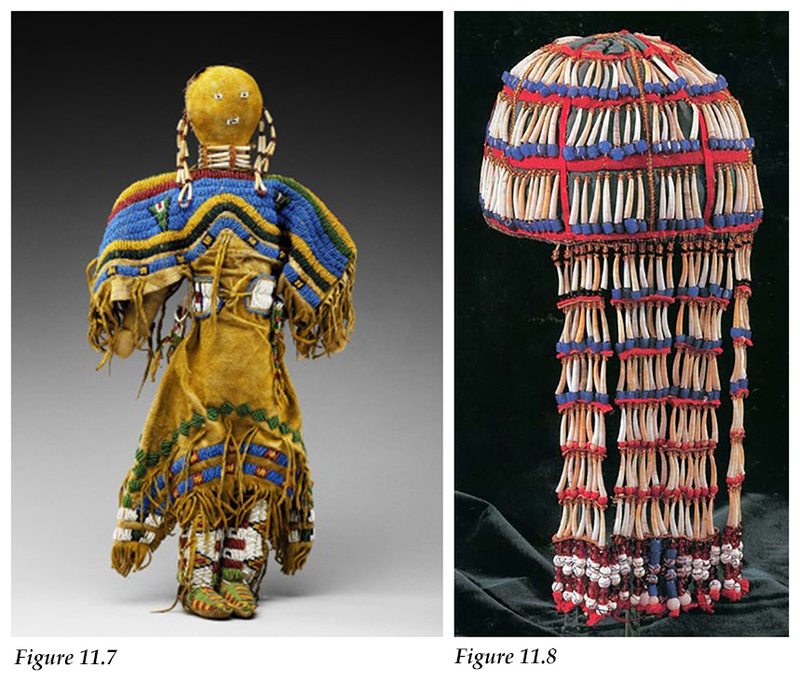 Figure 11.8 ▲ The headdress belonged to a Tlingit woman in the early 20th century named Anna “Bebe” Doah (Tlingit name Jiyal.áxch), the wife of a shaman named Berner’s Bay Jim. 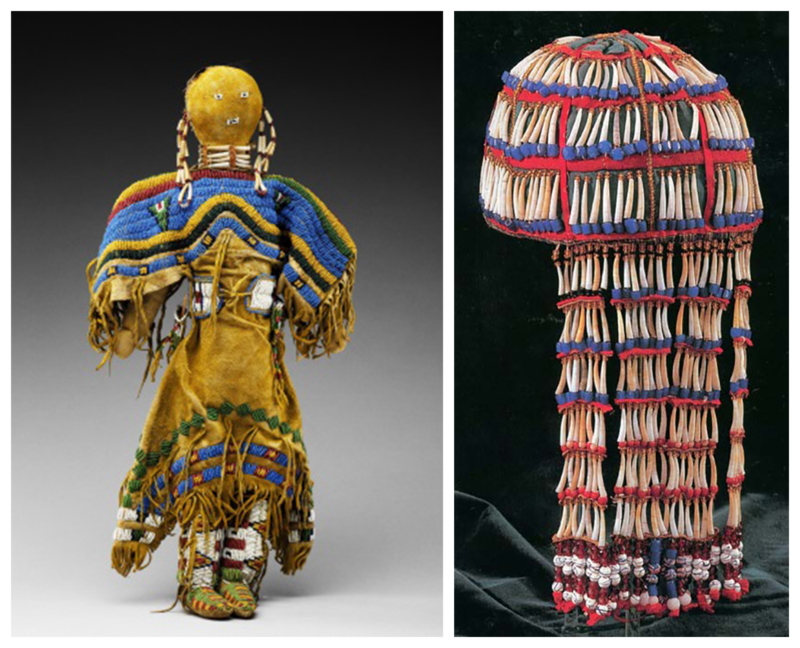 It is a rare type of Tlingit headgear similar to beaded headdresses worn by the Yup’ik, Unangax (Aleut) and Alutiiq/Sugpiaq people of Southwest and South Central Alaska. Photo courtesy of Alaska State Musuem, All rights reserved. It is generally agreed that the best dentalium shells were those harvested by the Ehattesaht and Quatsino people from shell beds off the west coast of Vancouver Island. These beds lay deep underwater—too deep for divers to hold their breath, too dark for them to see, and too cold to sustain a diving operation—so the Quatsino people designed specialized gear to harvest the money shells. Historical records indicate that a device with a very long handle and a bottom end resembling a “great, stiff broom” was used to pluck live dentalia from the seabed (Nuytten, 1993, p. 114) (Figure 11.9). Three of these implements still exist in museums in Victoria, British Columbia and Seattle, Washington. 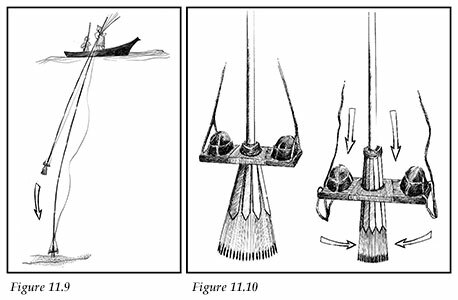 Figure 11.9 ▲ The Dentalium “broom” was lowered to the shell beds by adding extensions to the handle. Illustration by Laura Corsiglia (2007). 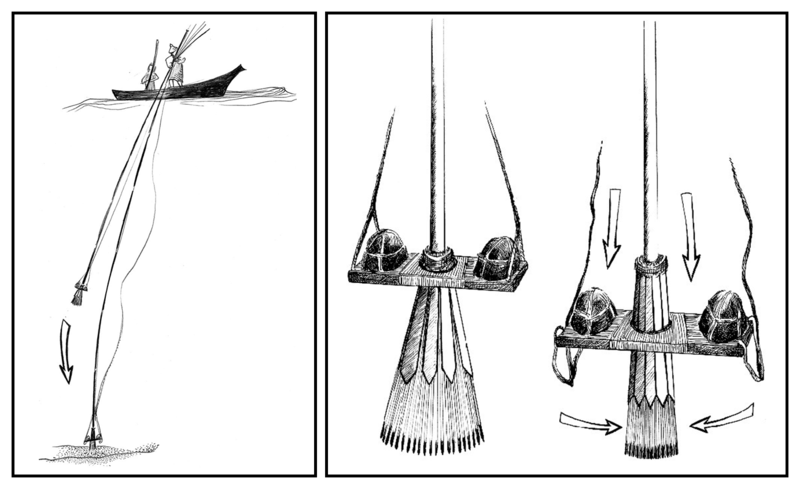 Figure 11.10 ▲ Phil Nuytten’s dentalia-harvesting broom outfitted with a weighted board. Loosening the ropes lowers the weighted board, an action that partially closes the broom head for grasping the shells. Illustration by Laura Corsiglia (2007). Some scholars have thought it unlikely that dentalia could have been harvested live, arguing that the broom would be too difficult to handle and that the organisms burrow too deep in the sediment. In 1991, Phil Nuytten—a deep-sea engineer and inventor of a robotic diving suit called the “Newt Suit”—resolved to fabricate a dentalium broom and find out for himself. “What I came up with,” Nuytten stated, “was a generic device—a hybrid based on various old descriptions and my own knowledge of how tools work underwater” (Nuytten, 2008a, p. 21). Nuytten enlisted the help of master carver John Livingston, who built the implement from local materials. He made the broom from a hundred sharpened yew splints, scorched to increase their hardness. He then sheathed the bundle in thin slats of springy yellow cedar (Figure 11.10). Attached to a 70-foot-long handle made in sections, the head would be lowered from the surface and jabbed into the sea bottom. A board, weighted down by rocks and operated by a separate line, would then be eased over the outer slats, thus trapping whatever had been pinched between the inner splints (Nuytten, 1993, p. 114). Figure 11.11 ▲ In the Sea Urchin, an eight-foot mini-submarine, Nuytten scans the sandy sea bottom for dentalia. Photo courtesy of Phil Nuytten, Nuytco Research Limited (1991). Figure 11.12 ▲ Scientist and expedition leader Phil Nuytten is lowered overboard from a winch to land on the sea bottom where he observed the dentalium broom at work. Photo courtesy of Phil Nuytten, Nuytco Research Limited (1991). In Kyuquot Sound, on the northwest coast of Vancouver Island, Nuytten looked for the underwater shell beds in his high-tech eight-foot mini-submarine—after Native scuba divers had pointed him toward the site. To test the harvesting implement, he then donned his Newt Suit and was lowered overboard by a winch to land on the dentalium beds below (Figure 11.11 and Figure 11.12). Once Nuytten was in a good viewing location, John Livingston lowered the broom over the shell beds and pushed it about 10 centimeters down into the sand and sediment. According to Nuytten (1993), “When he lifted it [the broom] up—jackpot! It worked like a charm” (p. 114). In order to introduce students to the story of dentalium shell money, and to excite their interest in a problem-solving activity, I developed a short powerpoint presentation. 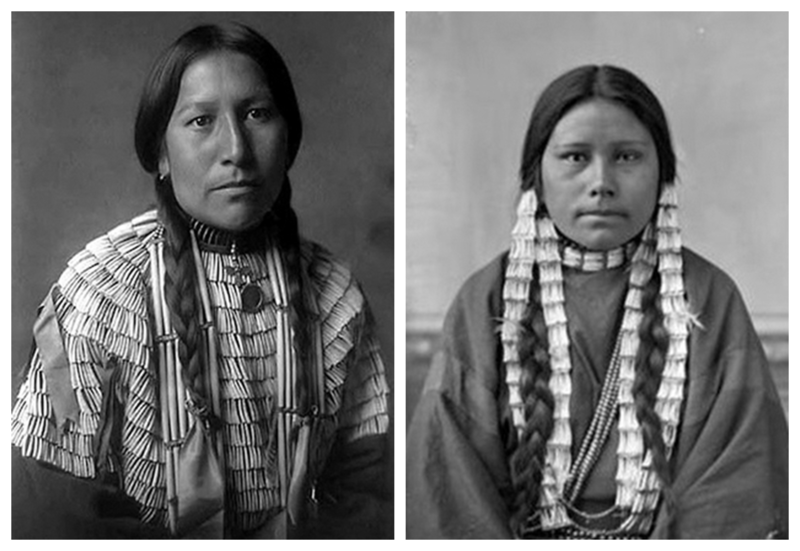 We began by looking at a 1908 photograph of the shell dress of an Oglala Sioux woman and discussing how clothing adorned with dentalium shells could signify an individual’s or family’s wealth. Students were then shown a map of the routes of the North American dentalium shell trade. They marveled at the extent of the trade and wondered how it happened that a shell could become a currency. Finally, we looked at 1991 photographs of Phil Nuytten’s mini-submarine and of Nuytten in his deep-sea diving suit being lowered from a ship. The photographs served to heighten the students’ curiosity. I asked: “If it takes a mini-submarine for modern scientists to locate dentalium beds, and a pressurized deep-sea diving suit to harvest a few shells, how could Native divers have harvested large quantities of dentalium shells?” It was clear that Native harvesters must have invented a tool, a trap, or some combination of a trap and strategy to harvest the shells. But what implement, and from what materials? To make the problem more intriguing, I informed the class that dentalium shells had not been harvested for over 100 years; hence, the traditional knowledge required to harvest the shells appeared to be lost. How deep are the dentalia? Do they come out of their shells? Will hermit crabs live inside their shells? Can dentalium animals be attracted to bait? How do they move? Do they stick to rocks or dig? Do dentalia rise to the surface to feed? Do they live in sand or on rocks? Would weather conditions such as storms make it impossible to harvest? Would the tides or time of year affect harvesting? Would the life cycle of dentalia be important to harvesters? In addition, I asked the students to brainstorm what materials would have been available to the Native harvesters for developing their technologies. The Grade 5/6 students posited rocks, cedar trees, shells, hides and bark. The Grade 11/12 students added obsidian, bones, ropes made from cedar strips or kelp, the power of water, and flotation devices made from seal stomachs. The students discussed possible answers to their questions, as well as how the Quatsino might have answered these questions. The students then worked in groups of three to five to design and draw a dentalium shell-harvesting implement. Each group was provided with large flip-chart paper, coloured crayons and felt pens for representing pictorially the invented implements and harvesting techniques or strategies. The groups took turns presenting their drawings and ideas to the class, describing their implement, the materials it was made from, and how their implement and/or strategy worked (Figure 11.13). I encouraged the class to ask questions of the presenters, to critically explore practical considerations and to address the question, “Would the implement work?” Most students were skeptical that their newly invented designs would actually work. 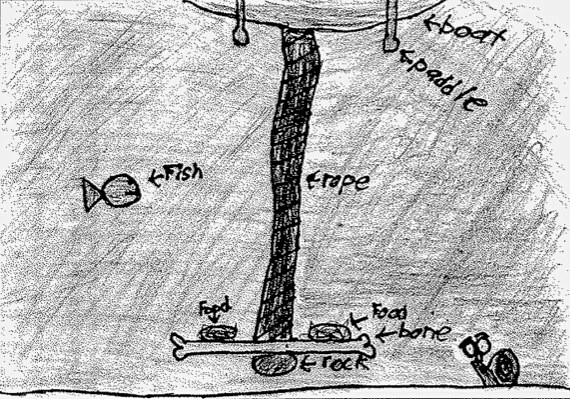 Figure 11.13 ▲ When challenged to design a dentalium-harvesting implement or technique, students came up with a variety of practical and fantastical strategies Drawing by student (2009). I then showed the students the second half of the powerpoint presentation, which introduced the Quatsino broom. We looked at sketches of the dentalia and discussed the organism’s adaptation to coarse, sandy bottom sediments; the long thin shells are streamlined for burrowing rapidly into sand with piston-like strokes of the mollusk’s muscular foot. I then showed sketches of the dentalium broom and explained how the broom worked; its handle was made in segments, and the harvesters would lower the broom head by adding extension poles one at a time. Students marveled at the ingenious implement and the problem-solving skills of the Indigenous harvesters. Our paper-and-pencil drawings had only begun to solve the numerous problems that would have been addressed as the broom was designed, tested, and modified over hundreds and thousands of years (see additional student drawings in Chapter 9). I asked the students whether, in the process of attempting to invent a dentalium harvester, they had been engaged in science. That is, had they asked questions, inferred, predicted, observed, communicated, built models, adapted, and interpreted information? The students were sure that they had engaged in science because the exercise had been an attempt to solve a difficult problem. I invited the students to consider these questions: Did Indigenous people engage in science when they developed the dentalium broom? To what extent had they made observations, asked questions, predicted, inferred, speculated, theorized, interpreted, invented and built models? To what extent were the originators of the broom required to understand the tides, ocean currents, adaptations of dentalia, qualities of materials, buoyancy, water pressure, and so on? The students agreed that although the broom was likely developed without knowledge of all of these concepts, the quest to solve the shell-harvesting problem was not haphazard. It was a systematic series of investigations conducted over a long period of time and involving a complex set of science-related concepts and processes. As it turns out, for this purpose, the Quatsino didn’t need to understand the dentalium life cycle (egg, larval stages, adult) or predator-prey relationships, but they did need to have a good knowledge of the type of substrate dentalia live in (rock, gravel, sand, mud), the properties of available materials, tides and currents, and which organisms are indicators of the presence of dentalia (e.g., sand dollars and the purple olive snail). We discussed the likelihood that the Quatsino built and tested numerous models of the dentalium broom before perfecting its technology. We also considered the similarity between attempting to build an implement that works in an unseen environment—in this case the deep, dark seabed—and the way scientists build models to represent and understand what we cannot see. I have conducted similar workshops with pre-service teachers, practicing teachers and graduate students. The result is always a celebration of drawings and strategies ranging from fairly skilled cedar baskets operated with a cedar rope, to variously fashioned nets or hooks designed to capture dentalia in the water column, or a variety of baskets, traps, scoops, rakes, snares and shovels designed to catch dentalia on the seabed. There are also fantastical ideas, such as a hollow cedar tree trunk through which the dentalia are coaxed to the surface with bait, a hollow tree through which a person climbs down to the bottom to pick up dentalia, a collection of hermit crabs that pick up the shells, and a trained shell-collecting octopus. (This activity is guaranteed to produce gales of laughter.) Not once has a student or teacher invented an implement similar to the one described in the historical journals. Clearly, the introduction of Aboriginal examples adds interest, excitement and authenticity to the science classroom. Similar science and technology activities could be developed around such topics as fishing equipment (the halibut hook or cod lure), dugout canoe, weir, fish wheel, tanning hides and cedar bent boxes. Students might also explore how Aboriginal people in different regions have dealt with the same concept or process. Even small differences in environment can result in surprisingly different ways of tanning hides, harvesting fish or making a canoe. Educators wishing to incorporate Indigenous Science examples into their teaching practice can begin by consulting Elders and other Aboriginal resource persons or the burgeoning literature on Indigenous knowledge in the areas of natural and earth sciences, medicine, agriculture, botany, ecology, astronomy, aquaculture, navigation, architecture, engineering, climatology and political science. Cross-cultural science education is not merely throwing in an Aboriginal story, putting together a diorama of Aboriginal fishing methods, or even acknowledging the contributions Aboriginal peoples have made to medicine. Most importantly, cross-cultural science education is not anti-Western science. Its purpose is not to silence voices, but to give voice to cultures not usually heard and to recognize and celebrate all ideas and contributions. It is as concerned with how we teach as with what we teach. Instead of the teacher defining what science is for the students upfront, let students explore what the word “science” means to them. Encourage them to ask: Do traditional peoples have their own science? Have they made contributions to the body of knowledge we call “science?” If our ultimate goal is to have the greatest number of students derive the most benefit from our science lessons, we must plan these lessons to be inclusive. Our choice of wording, readings, experiments, classifications, resource persons and concepts can include and engage all students, or it can risk alienating students who see no depictions of people like themselves and thus receive an unintended message that science has nothing to do with them. Much work needs to be done to create or revise science education lessons and activities to fit a cross-cultural science framework, but it is not impossible or overwhelming. If teachers can understand how the purposes of scientific activity have varied in different cultures and times, and how different cultures have developed science to meet their needs, then they can work towards developing innovative and culturally sensitive resource materials and teaching strategies that will increase the science literacy of all students. This chapter was adapted with permission from Snively, G. (2009). Money from the sea: A cross-cultural Indigenous science problem-solving activity. Green Teacher, 86, 33-38. Nuytten, P. (1993). Money from the sea. National Geographic, 183(1), 109-117. Nuytten , P. (2008a) Shelling out. Diver, August, 34(3), 14-23. Nuytten, P. (2008b) Shelling out II. Diver, September, 34(4) 26-33. Snively, G. (2009). Money from the sea: A cross-cultural Indigenous science problem-solving activity. Green Teacher, 86, 33-38. Chapter 11 - Money from the Sea: A Cross-cultural Indigenous Science Problem-solving Activity by Gloria Snively and Wanosts'a7 Lorna Williams is licensed under a Creative Commons Attribution-NonCommercial-ShareAlike 4.0 International License, except where otherwise noted.